BRAND NEW for 2007-2013 Chevrolet Silverado - RECON's Highly Anticipated Projector Headlights with New Cutting Edge CCFL Halos and Daytime Running Lights! 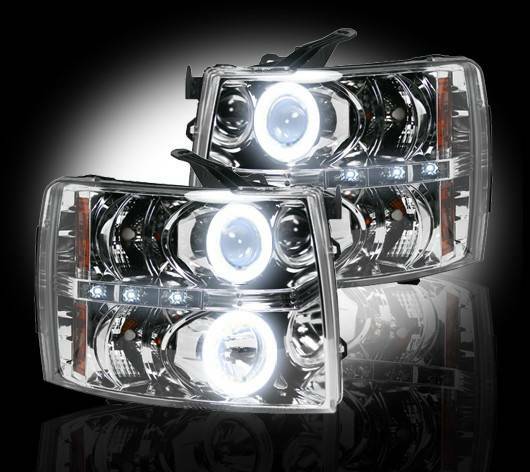 These Chevrolet Silverado 07-13 RECON Projector Headlights with CCFL Technology are sold as a set & use H1 Style Headlight Bulbs for the Projector Low-Beam and H1 Style Headlight Bulbs for the High-Beam. RECON projector headlights come with 4 standard halogen bulbs already installed; however, if you wish to upgrade to HIDs or XENON Headlight Bulbs for your projector Low-Beams, then you must order 1 set of any of the the following part #'s: 264H1HID, 264H1DW, 264H1PB, or 264H1SY. If you wish to also upgrade to HIDs or XENON Headlight Bulbs in the High-Beam portion of your new RECON Projector Headlights, then you must also order 1 set of the following part #'s: 264H1HID, 264H1DW, 264H1PB, or 264H1SY. Keep in mind there are two H1 bulbs in each projector headlight, so you will need to buy two sets of headlight bulbs for each set of Chevy Silverado projector headlights you are upgrading the bulbs in assuming you want to upgrade both the low-beam and the high-beam.